First time ever I've done this: sowing my own seeds and really intending to grow vegetables like a proper farmer. Not on a grand scale mind you, but enjoying mucking about. First thing I had in mind: only sow things you really like and are going to eat or are pleasant to look at or will propagate themselves the year after without having to sow again. Last year we put in fennel, and I do not like the taste of anise at all. I was very much the person in form last year and managed to recuperate sun flower seeds (which most of them were shared with the birds), dill seeds (loads of them), radish seeds and too much marigold seeds. I also stripped the wild flowers that were in the front garden from some seeds so I will be sowing them a little bit later on directly into the ground. But some trips to different garden centers for different seeds got me started. I bought a little planter device to make little heaps to put the seeds in. I thought I would help myself by labeling everything I've sown and mentioning the date I sowed them on. They were in the heated conservatory for about 1,5 weeks and slowly started to bud. Spinach was first out. Much to our astonishment, after we eagerly transported the containers to the greenhouse, just after a couple of hours nearly 50% of everything had come up! Just like putting a cake in the oven, and a couple of hours later: hey presto! Amazing. We were quite chuffed to be honest! All are starting to bring forth small, but confident little green leaves, bar the larkspur. Perhaps I was a bit too early in sowing them. 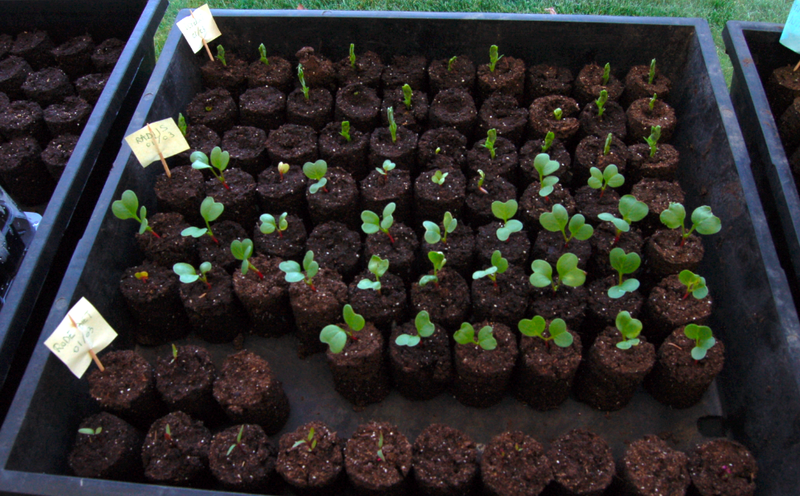 I also used old seeds ('to be sown before 2005') it said on the packing. But they're doing fine. Once everything is of an acceptable size it will be warm enough to put them in the soil outdoors. 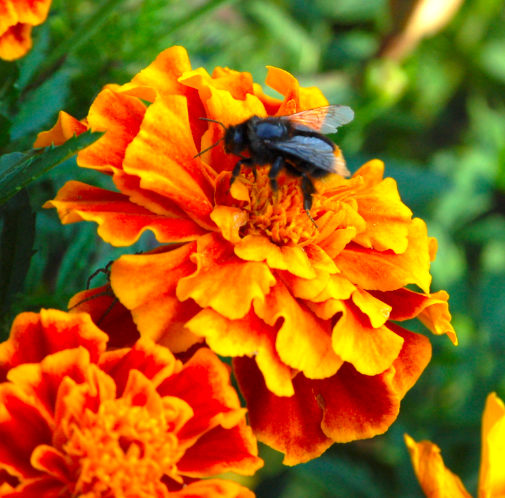 The marigolds are going in rows between vegetables to keep away unwanted insects from roots and what have you. We also put them in the front garden last year, to that patch of ground has now been 'cleaned up' and we will put veggies in on that spot. Seedlings looking good. Mine always seem to end up as snail buffet.